From Pets Best, a pet insurance agency for dogs and cats. As the snow and ice begin to blanket the ground, so does the ice melt. While ice melt is important for our safety, it can mean health issues for your dogs and cats. The biggest pet health danger is ingestion of the ice melt salt, either while outside or after a walk when pets clean their paws. Additionally, walking on small rocks of salt can cause paw irritation, especially if the paws are dry and cracked due to cold winter air. The main chemical found in most salts and ice melts is chloride. According to animal expert and speaker Diana Guerrero, sodium chloride, potassium chloride, and magnesium chloride are often found in ice melts and should not be ingested by pets. According to veterinarian Dr. Eva Evans, health care issues can arise from ingesting those ingredients. Guerrero also lists calcium carbonate, calcium magnesium acetate, and urea as other dangerous chemicals found in de-icers, which can cause vomiting, eye irritation, hyper salivation and abdominal pain. Ice melt packages don’t always list ingredients, and there’s no telling what products neighbors use. So to avoid dog and cat health care issues from ingestion of chemicals that trail inside the home, paws and shoes should always be wiped off when entering a house. 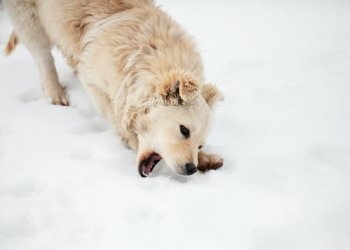 Some ice melts that are safe for pets include Morton Safe-T-Pet, Howard Johnson’s Pet-Guard Ice Melt, and Ossian’s MAC.